One of the very much scarcer products from Carlton Ware in the Novelty Ware series. 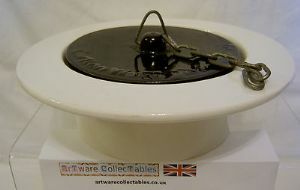 Designed by Roger Michell (Lustre Pottery) for Carlton Ware, this particular item is from the very much sought-after Fun Series, this one being an Ashtray designed as a Bath Plug. The small series series was produced only during the 1970s before being discontinued. It featured a few household items such as the Tap Teapot, the Nail and Screw cruet set and this Bath Plug. 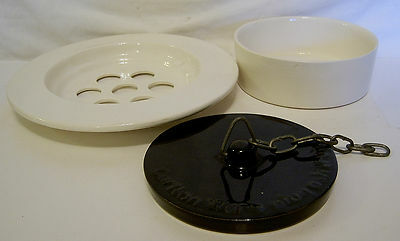 The Ashtray is in three parts with the Lid having a length of chain. There is evidence of a little light crazing. It is a large ashtray with a diameter of 7 inches (17.5 cms).